Every two and a half hours, a new wind turbine rises in the U.S. In 2016, wind provided 5.6 percent of all electricity produced, more than double the amount generated by wind in 2010, but still a far cry from its potential. A team of researchers from The University of Texas at Dallas (UT Dallas) has developed a new way to extract more power from the wind. This approach has the potential to increase wind power generation significantly with a consequent increase in revenue. Numerical simulations performed at the Texas Advanced Computing Center (TACC) indicate potential increases of up to six to seven percent. According to the researchers, a one percent improvement applied to all wind farms in the nation would generate the equivalent of $100 million in value. This new method, therefore, has the potential to generate $600 million in added wind power nationwide. The team reported their findings in Wind Energy in December 2017 and Renewable Energy in December 2017. In the branch of physics known as fluid dynamics, a common way to model turbulence is through large eddy simulations. 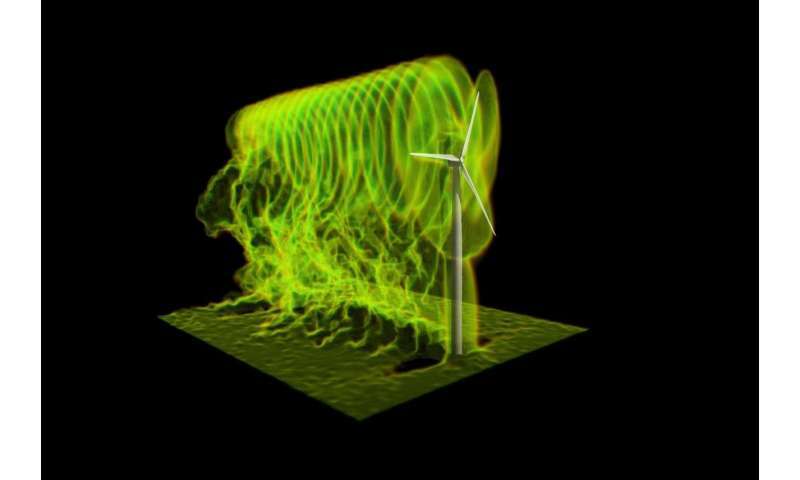 Several years ago, Stefano Leonardi and his research team created models that can integrate physical behavior across a wide range of length scales—from turbine rotors 100 meters long, to centimeters-thick tips of a blades—and predict wind power with accuracy using supercomputers. "We developed a code to mimic wind turbines, taking into account the interference between the wake of the tower and the nacelle [the cover that houses all of the generating components in a wind turbine] with the wake of the turbine rotor," said Leonardi, associate professor of mechanical engineering and an author on the Wind Energy paper, which was selected for the cover. Beyond the range of length scales, modeling the variability of wind for a given region at a specific time is another challenge. To address this, the team integrated their code with the Weather Research and Forecasting Model (WRF), a leading weather prediction model developed at the National Center for Atmospheric Research. "We can get the wind field from the North American Mesoscale Model on a coarse grid, use it as an input for five nested domains with progressively higher resolution and reproduce with high fidelity the power generation of a real wind farm," Leonardi said. The growing power of computers allows Leonardi and his team to accurately model the wind field on a wind farm and the power production of each single turbine. Testing their model's results against data from a wind farm in North Texas, they saw a 90 percent agreement between their predictions and the turbine's efficiency. They will present their results at Torque 2018, a major wind energy research conference. Wind doesn't simply flow smoothly in one direction. It contains turbulence and wakes which are magnified when turbines are grouped together as they are on a wind farm. Wake interactions lead to losses of up to 20 percent of annual production, according to the U.S. Department of Energy. Understanding how turbulence impacts energy generation is important to adjust the behavior of the turbines in real-time to reap maximum power. Using their modeling capabilities, they tested control algorithms that are used to manage the operation of dynamic systems at wind farms. This included the control algorithms known as extremum seeking control, a model-free way of getting the best performance out of dynamic systems when only limited knowledge of the system is known. "Many thought it would not be possible to use this approach because of turbulence and the fact that it provides a situation where turbines are changing all the time," Leonardi said. "But we did a huge number of simulations to find out a way to filter turbulence out of the control scheme. This was the major challenge." With extremum seeking control, the system increases and reduces the rotational speed of a spinning turbine blade, all the while measuring the power, and calculating the gradient. This is repeated until the controller finds the optimal operating speed. "The important thing is that the control algorithm does not rely on a physics-based model," Leonardi said. "There are many uncertainties in a real wind farm, so you cannot model everything. The extremum seeking control can find the optimum no matter if there is erosion or icing on the blades. It's very robust and works despite uncertainties in the system." To test their new approach, the team ran virtual wind experiments using supercomputers at the TACC, including Stampede2 and Lonestar5 - two of the most powerful in the world. They were able to use these systems through the University of Texas Research Cyberinfrastructure (UTRC) initiative, which, since 2007, has provided researchers at any of the University of Texas System's 14 institutions access to TACC's resources, expertise and training. Access to powerful supercomputers is important because wind turbines are expensive to build and operate and few wind research facilities are available to researchers. "The benefits of using high performance computing to create a virtual platform for doing analyses of proposed solutions for wind energy are enormous," said Mario Rotea, professor of mechanical engineering at UT Dallas, and site director of the National Science Foundation-supported Wind-Energy Science, Technology and Research (WindSTAR) Industry-University Cooperative Research Center (IUCRC). "The more we can do with computers, the less we have to do with testing, which is a big part of the costs. This benefits the nation by lowering the cost of energy." While the application of extremum seeking control to wind farms is yet to be field tested, the UT Dallas team already applied the method to a single turbine at the National Renewable Energy Laboratory (NREL). "The NREL test gave us experimental data supporting the value of extremum seeking control for wind power maximization," said Rotea. "The experimental results show that extremum seeking control increases the power capture by 8-12% relative to a baseline controller." Given the encouraging experimental and computational results, the UT Dallas team is planning an experimental campaign involving a cluster of turbines in a wind farm. The development of the fluid dynamics model for wind turbines was part of an international collaboration between four U.S. institutions (Johns Hopkins University, UT Dallas, Texas Tech and Smith College) and three European institutions (Technical University of Denmark, École polytechnique fédérale de Lausanne and Katholieke Universiteit Leuven) funded by the National Science Foundation. Through the WindSTAR center, they collaborate with nine leading wind energy companies and equipment manufacturers. These companies are interested in adopting or commercializing the work. "The members of our center do not have access to a lot of horsepower in terms of HPC [high-performance computing]," said Rotea. "The computers at TACC are an asset for us and give us a competitive advantage over other groups. In terms of solving actual problems, we create control systems that they may incorporate, or they may use HPC to develop new tools for forecasting wind resources or determine if there are turbines that are not performing." In addition to developing the new turbulence algorithms and control strategies, members of the WindSTAR team have introduced methods to predict accurate results on less-powerful computers (work that appeared in the March 2018 issue of Wind Energy) and to determine how closely to place turbines to maximize profits, depending on the cost of land (presented at the 2018 Wind Symposium). The long-term effects of the work go beyond the theoretical. "The research allows us to optimize wind energy power production and increase the penetration of renewable energy in the grid," Leonardi said. "There will be more power generated by the same machines because we understand more about the flow physics in a wind farm, and for the same land use and deployment, we can get more energy."